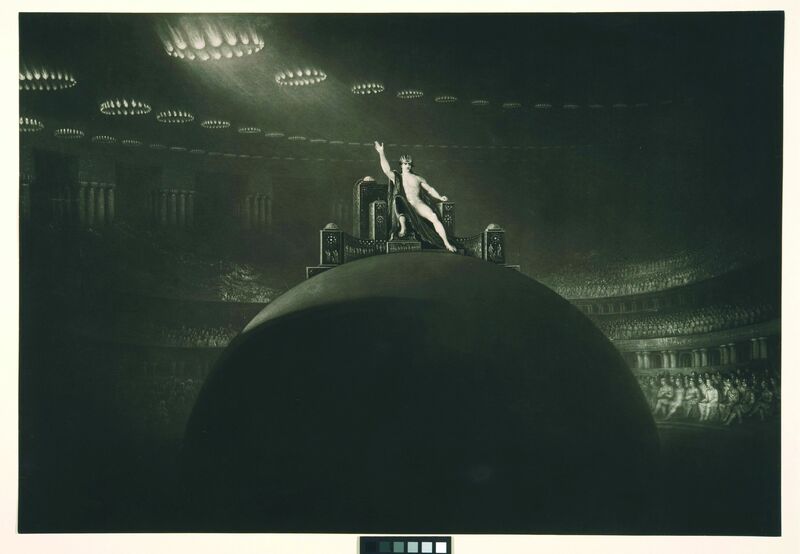 Interpreting John Martin: What do you think? For every exhibition at Tate, we produce a range of interpretative materials to help visitors understand and engage with the art on display. Our approach varies with each show, depending on the exhibition’s focus (for example, the interpretation for the Turner Prize is different to that for an exhibition of paintings by Turner). We work very closely with the exhibition curators to produce interpretation that visitors will find useful and informative. The main interpretation in each room of John Martin is the wall text. The exhibition is arranged chronologically and the texts introduce the main ideas of each section – tricky to do in under 200 words! The curator also wrote captions for most of the works on show. The exhibition leaflet explores the huge influence John Martin has had on film makers, writers, musicians and other artists. We sourced images – from films like Intolerance (director DW Griffith based the look of the film directly on Martin’s paintings) and 2012 – that show a Martin-like apocalyptic vision. Many people have spoken about his influence and we tried to include quotes from them. Looking at the works on the wall of the exhibition it is amazing how contemporary some of them seem. A number of Martin’s large oil paintings went on extensive tours and we tried to demonstrate the sense of awe and excitement the viewers of these paintings at the time would have had. We have done this through a dramatic sound and light show. 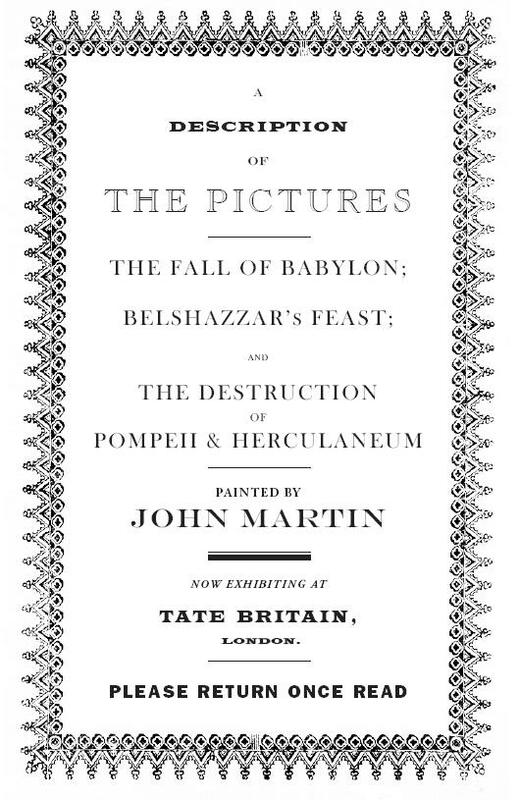 The exhibition curator Martin Myrone discusses it brilliantly on the Tate blog. We have also produced a pamphlet that recreates the catalogues that were produced to accompany tours of Martin’s paintings (the originals are also on display). They include etched painting outlines and descriptions. We toyed with the idea of putting this information on a wall panel – but in the end we thought it would be more useful (and more fun) to re-create the material in the same format as the original. We have produced an audio tour for the show. 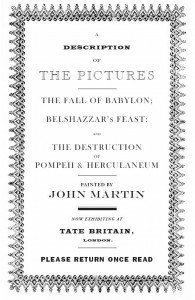 This goes into more depth on about 20 works in the show and is useful for anyone who wants a bit more information – it is especially interesting to hear Martin Myrone talking about John Martin. You could argue that the final painting in the exhibition provides a final piece of interpretation. It is The Tragic Conversion of Salvador Dalí (after John Martin) by contemporary artist Glenn Brown. It was a curatorial decision to put it in the show but its juxtaposition with the John Martin works that inspired it perhaps makes a comment about the Martin paintings that words cannot do… What do you think? I am really interested to find out about what you think about exhibition interpretation. Is there too much text on the walls? Not enough? What is the purpose of the leaflet? Should it contain the wall texts or can it be an additional information resource? Kirsteen McSwein is Assistant Curator for Interpretation at Tate Britain. As well as John Martin, she was worked on the interpretation for many other Tate shows, including The Vorticists, Richard Long and The Turner Prize. Join the debate about Art in Britain today! I'm a disabled amateur painter, so can't visit the Tate, but would love to know more about Mary Beale..Who taught her? Why did she paint on paper? Is there a book about her life and painting techniques? I'd be grateful for any other information you can offer. Thankyou! Lesley Scott on Help us decide what we hang at Tate Britain!